TurboTaxTurboTaxCheck priceStep-by-step instructions and a user-oriented design take the guesswork out of doing your taxes. TurboTax’s online app is incredibly intuitive, with large buttons and friendly, conversational text. You can upload your W-2 simply by taking a picture of it, and if your employer’s payroll provider is a TurboTax partner, you can import it directly with a few clicks. Its tablet and mobile apps are just as navigable, and you can transition seamlessly from one device to another. TurboTax has managed to make doing your taxes feel like a simple game, a breezy slideshow that might end with a fat refund check and no audit. You can live and video chat via mobile too — you won’t sacrifice any features with mobile filing. During our testing, we loved that TurboTax didn’t push its high-priced options when we didn’t need them. Right from the start, TurboTax helps you choose the software that is best for you depending on your needs, even if it’s the free version. On its recommendation screen, we entered that we had a job, dependents, and rent payments, and it still pointed us right to the free federal 1040 option. From there, filing with TurboTax was like having a pleasant grade-school teacher direct us through our taxes. The software is incredibly instinctive, and our testers never felt lost, thanks to ever-present help functions and guides. When providing our health insurance information, for instance, TurboTax offered detailed but straightforward explanations to help our tester figure out what type of coverage they had. Even self-employed beginners will find unique support tool through the QuickBooks included subscription. It’s an expense-tracking feature that can store photos of your receipts and help pinpoint any transaction that may qualify as a business deductible. We also like that TurboTax checks in to make sure you understand why your taxes are being filed in a particular way. If you aren’t 100% confident, TurboTax keeps you moving but promises to go over the information again later. TurboTax also rewards you for successes; after the completion of almost any task, even an incredibly tiny one, TurboTax is quick to give a pat on the back with an entire screen dedicated to a big thumbs up: “Great job so far!” When we’re in the throes of tax season, we’ll take any clarification and encouragement we can get (even if it’s from software). 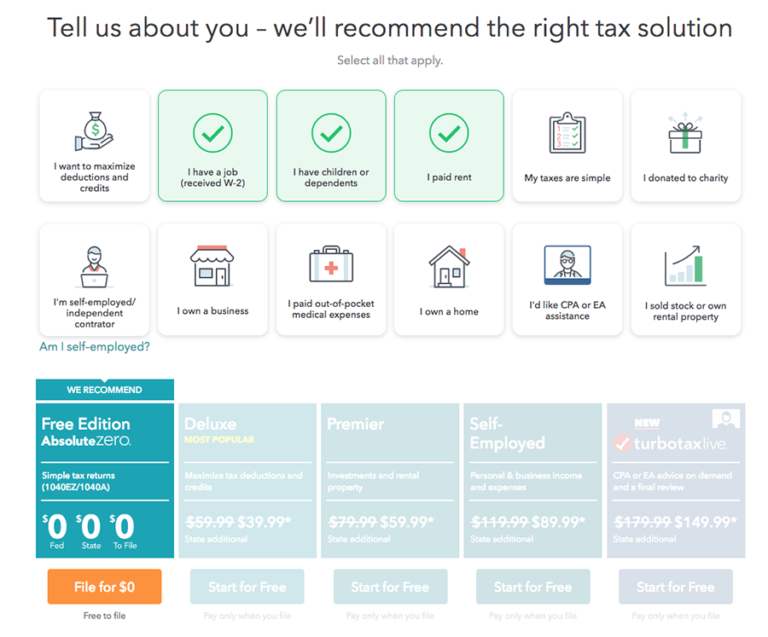 TurboTax’s blog alone won favor for its robust guides to all things taxes — whether it’s an article on what tax brackets are or a detailed explanation of how the new tax reforms will affect you. 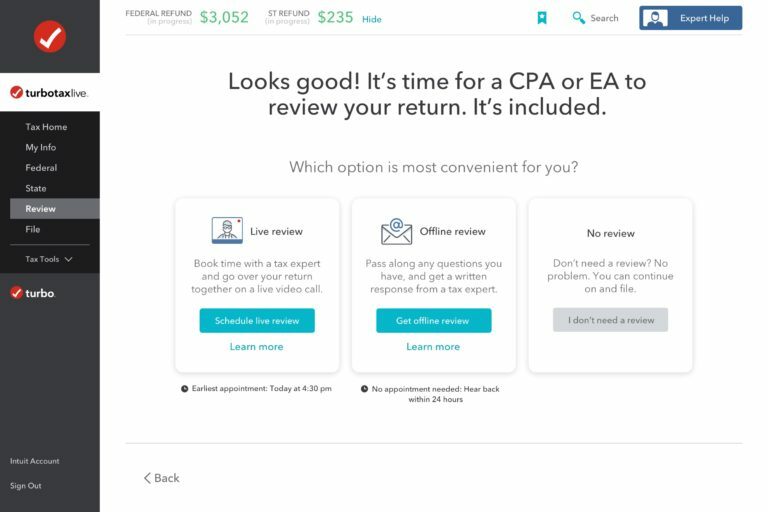 In its second year, the TurboTax Live service, which connects you via one-way video to a certified public accountant (CPA) or enrolled agent (EA), is still a seamless resource. Your filing process starts with a one-on-one talk with a CPA, and you receive their continued support and advice as you go through the process. After connecting with a tax expert, you can get professional advice on maximizing your returns, and your assigned CPA or EA will even review your entire return to get as many dollars back as possible. The one downside is cost, which ranges from $50 to $170 depending on your filing status. TurboTax Live is the most expensive software packages we found, but is still cheaper than going to a tax professional. If you don’t need help from a CPA or EA, you can also get extra help with any paid plan through SmartLook™, which connects you via one-way video to a TurboTax specialist. With this service, a specialist can help guide you through the steps of filing a return, though they won’t be able to answer tax-specific questions to maximize your return like a CPA or EA would. No matter which service you use, you’ll be able to schedule appointments anywhere from the same day to dates more than two weeks in advance, which means that even the busiest of customers can get the help they need. While TurboTax provided the best online tax filing experience we saw, it does come at a price. Like all of our picks, it offers free filing for federal and state taxes, but anything above that will cost you. Its Deluxe plan starts at $60, while the package for self-employed filers climbs to $120. In comparison, TaxAct’s paid plans start at $15, with the self-employed option costing $60. That said, it’s very possible that TurboTax’s excellent deduction tools could help you save money and file easier, even with the higher upfront price.